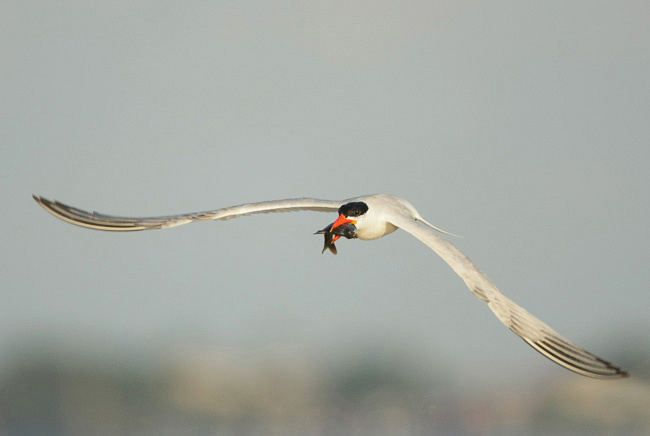 Photographic theme: images made on James Shadle’s flats boat/712 & 13. Canon EF 400mm f/4L DO lens with the EOS-1D Mark III. ISO 400. Evaluative metering +2/3 stop: 1/1600 sec. at f/8 in Manual mode. For birds flying directly at me I am now setting C.Fn. III-2 to High and using 45-point. See more details below in MORE MARK III TIPS & MIII UG COMMENTS. After repeatedly borrowing the 400 DO lens from CPS, I finally broke down and purchased my very own. While photographing on James Shadle’s boat for the last 2 days I had the opportunity to use each of Artie’s three EOS-1D Mark III camera bodies. I created about 2000 images; thanks a million Artie! Having given up 2 waiting list spots to good friends of mine in June I have had only had limited chances to use the EOS-1D Mark III since February. Aside from the easy changes like back button ( * ) AF, slow tracking, and 45 point AF the 5 different Mark III cameras that I have used have not been set up with my personal preferences. So far I have found that the AF system works great. I wouldn’t say the AF system is an improvement over the s EOS-1D Mark II N but I haven’t had any problems at all with the AF either. I would expect that with additonal time in the field and a personally- tuned EOS-1D Mark III that the AF system would be deadly. I am aware of the AF issues reported by many people including a few friends of mine. Though I might be flamed for voicing my opinions here I am just reporting honestly on experiences; your mileage may vary. I was able to look back at images made over the past year or so with my 1DSMKII and 1DMKIIN since I save copies of folders with intact deletes. I have found that the AF success rates with the MIII are similar to success rates with the other professional digital camera bodies (none of which are 100% on target). (AM note: Robert is far more skilled than I as a flight photographer and his percentage of sharp images are much higher than mine with whatever camera he is using—even mine…) My 1DSMKII in fact may have the best AF success ratio of all. For the record, I have been using Canon EOS since 1992 and EOS Digital SLRs since my D30 which I purchased for $3400, in 2000. I purchased my first Canon EOS-1D body for $5400 in 2001. I was able to get a $100 discount on my second 1D ! I have been photographing professionally since 2001 and have owned 1DS, 1DMKII, 1DSMKII, and 1DMKIIN pro bodies. Taking these factors into account I probably have more years using Canon 1D series bodies than most people. Canon EF600mm f/4L USM lens with the 1.4X II TC and the EOS-1D Mark III. ISO 200. Evaluative metering +2/3 stop: 1/1000 sec. at f/5.6 in Manual mode. 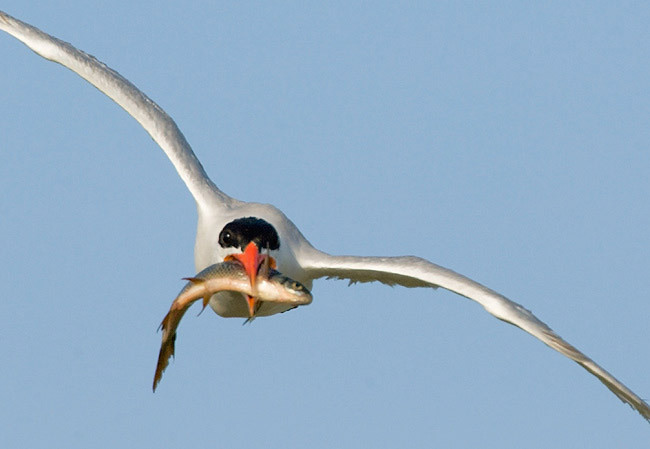 Terns in flight have always been a favorite of mine. Here I captured a parent pausing for a split second before diving almost straight down to the colony to feed its chick. All the images were made with 45 point AF. Since November 2005 I have been using 45 point AF almost exclusively. Canon EF600mm f/4L USM lens with the 1.4X II TC and the EOS-1D Mark III. ISO 200. Evaluative metering +2/3 stop: 1/1250 sec. at f/5.6 in Manual mode. 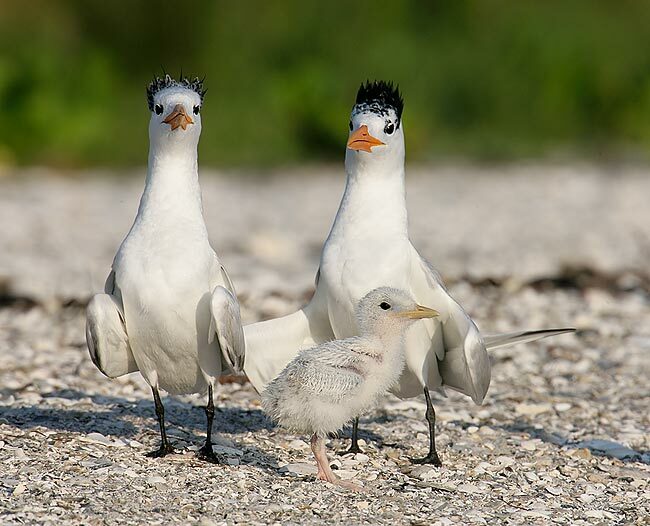 Caspian tern juveniles are absolutely gorgeous. I was constantly on the look out for the juveniles practicing takeoffs and landings. Here I was lucky to get one banking over the colony. Canon EF600mm f/4L USM lens with the 1.4X II TC and the EOS-1D Mark III. ISO 320. Evaluative metering +2/3 stop: 1/1000 sec. at f/5.6 in Manual mode. To maximize success with a high frame rate capable camera it is important to use restraint and wait for the subject to fill the frame before releasing the shutter. Here I waited until I could see details in the birds face, but not too late as to clip the wings. Canon EF600mm f/4L USM lens with the 1.4X II TC and the EOS-1D Mark III. ISO 200. Evaluative metering: 1/1250 sec. at f/5.6 in Manual mode. It was a blessing to have a hazy sun disk on Friday morning with so many terns in the air. The technique is simple; the MKIII frame rate and deep buffer are great assets when trying to create images like this. 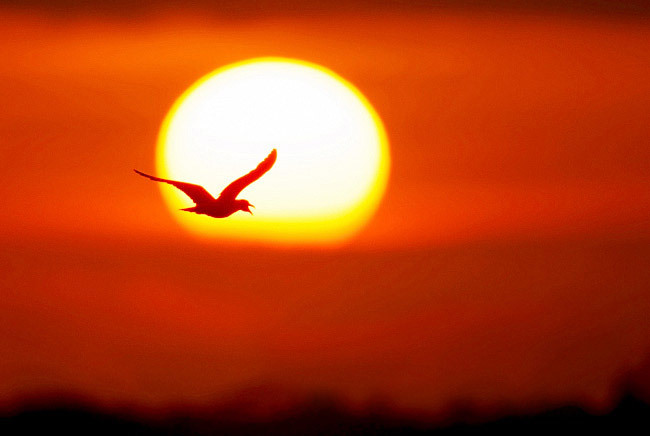 Meter the sun, set your exposure manually, lock onto a bird as it flies by at the same height as the sun and pan. When you see the bright orange near the disk-edge, hold the shutter button down until the bird is past the sun. Canon EF600mm f/4L USM lens with the 1.4X II TC and the EOS-1D Mark III. ISO 200. Evaluative metering +2/3 stop: 1/800 sec. at f/5.6 in Manual mode. As I made this image I could see the fish wriggling and fighting to escape. All in all we had three great sessions. 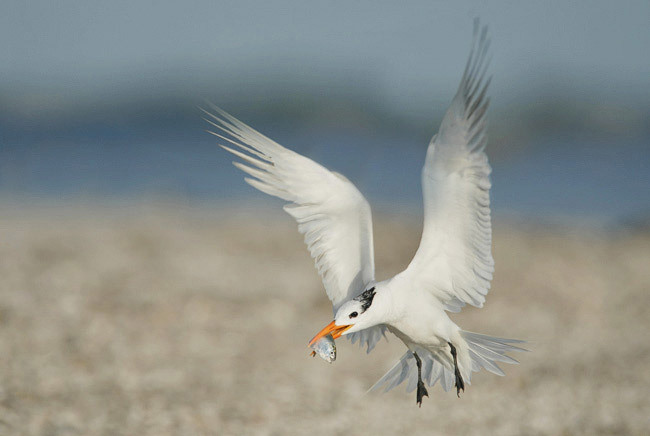 When folks ask me about photographing in Florida during the summer months I run out of suggestions after mentioning Fort DeSoto (http://www.birdsasart.com/siteguides.htm#the%20Fort%20DeSoto/Sarasota%20Site-Guide). When I headed out to Tampa Bay this past Thursday and Friday I really had my eyes opened. 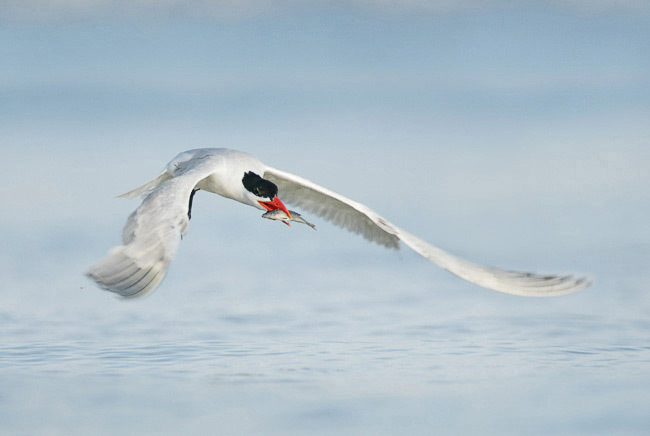 I got to photograph Caspian Terns in flight, juvenile Caspian Terns, Royal Terns and Laughing Gulls in flight and feeding young, recently fledged Little Blue Herons, Reddish Egrets, White Ibises, and Brown Pelicans. 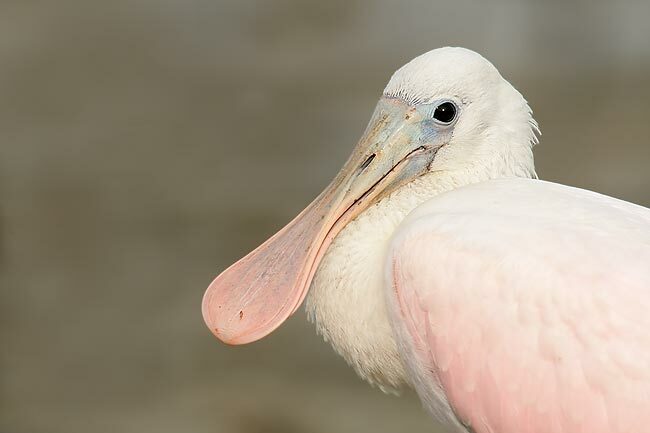 And I got my head portraits of baby Roseate Spoonbills. There was so much to photograph that at times you simply could not decide where to point your lens. You can see a selection of my images below. 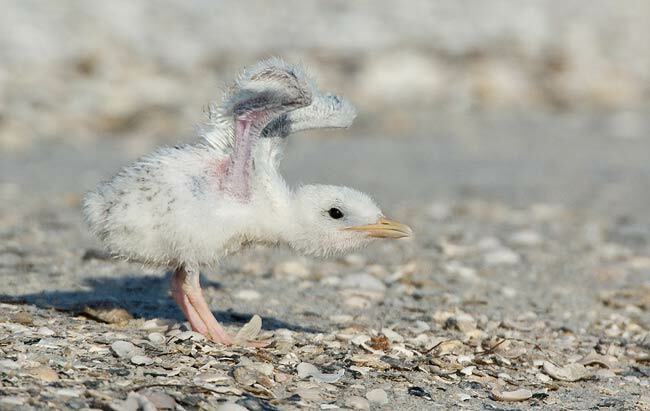 There are about two weeks left in the baby bird season on Tampa Bay. If you would like to join Jim for a full or half-day, you can contact him as follows: by cell phone at 813-363-2854 or via e-mail at James@wildflorida.net. Nikon 600mm F4 ED AF-S lens with TC14E and the Nikon D2X. ISO 400. Exposure Based on a value of 2/3 of a stop less than Sunny 16 - 1/3 stop: 1/2000 sec. at f/8.0 in Manual Mode. 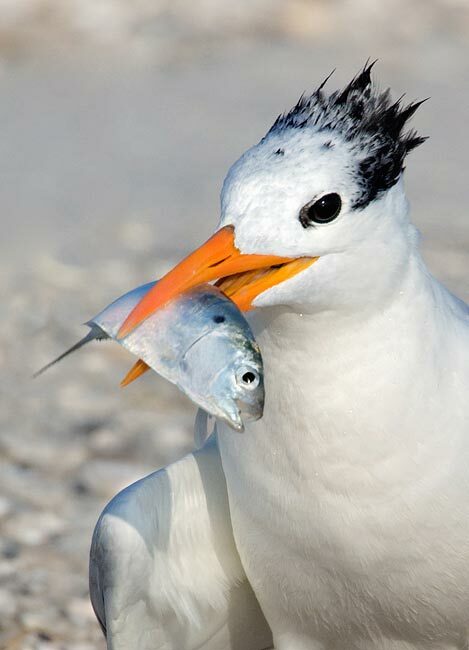 As a great bird photographer once said, "You gotta love it!" To capture an image like this requires being there and being prepared. If you know your exposure value and camera controls, nailing the decisive moment becomes a little less difficult. Nikon 600mm F4 ED AF-S lens with TC14E and the Nikon D2X. ISO 400. Exposure Based on a value of 2/3 of a stop less than Sunny 16 - 1/3 stop: 1/400 sec. at f/14 in Manual Mode. 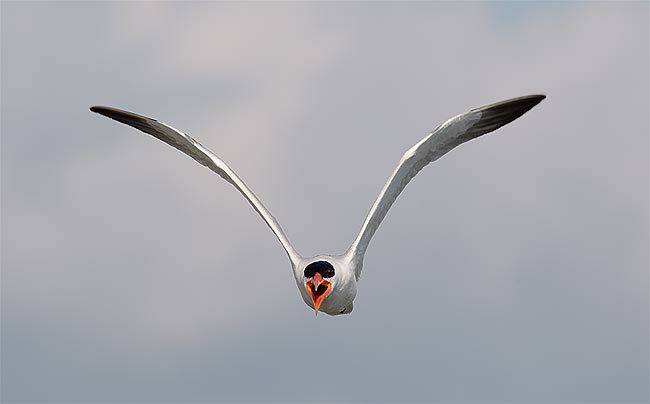 Knowing my subject allowed me to get my TC14E on in time to capture this tight shot of a Royal Tern preparing to feed a baby. 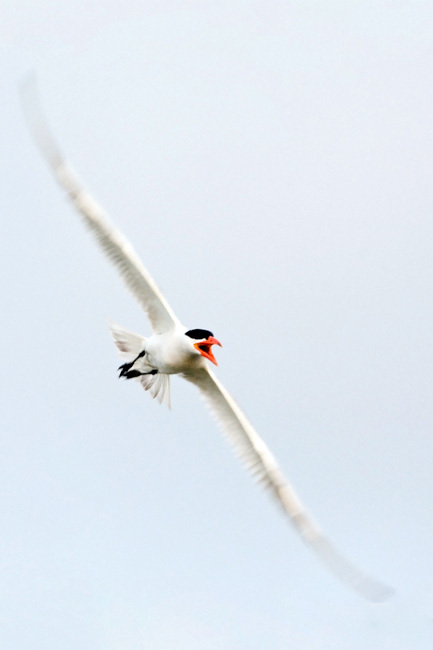 Tip: listen to the Terns. 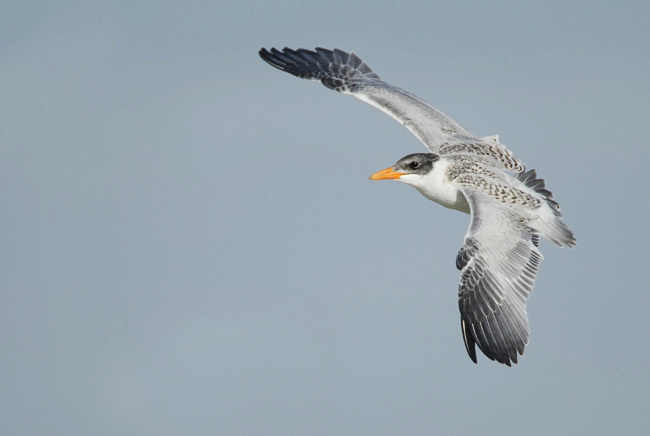 Those making the most noise while flying about are trying to locate their chicks and almost always have a fish. Predictable, repeatable behavior; I love it! If you know your subject making this type of image can be come routine. Exposure is based on a value of 2/3 a stop less than sunny 21. Shooting a high key image with the histogram to the right sure does help to keep the noise down. If you want maximum image quality and minimum noise you must nail the exposure (regardless of which camera system you are using). Note: The soft cover version of “The Art of Bird Photography; The Complete Guide to Professional Field Techniques” has been dropped by Amphoto and is currently out of print. We have approximately 50 copies left. Because the book has been harder and harder to get, our sales have increased. We have purchased the film from Watson Gupthill and will be re-releasing the book with a new cover under the BIRDS AS ART imprint in about six months. 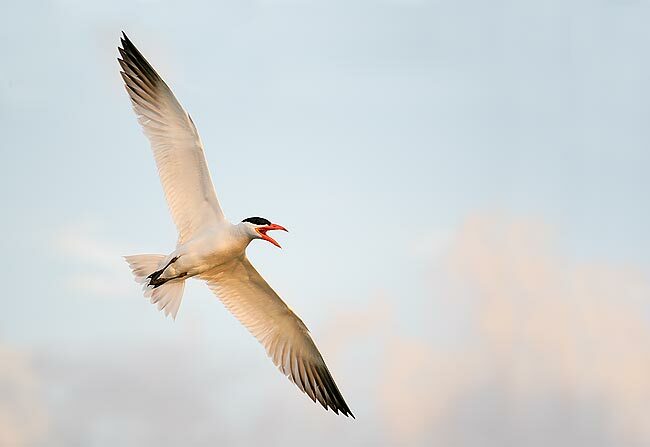 In January 2003, I began work on “The Art of Bird Photography II” (ABP II). “The Art of Bird Photography II is an all-new continuation of the original “The Art of Bird Photography; The Complete Guide to Professional Field Techniques.” At 916 pages with more than 900 images, ABP II is available only on CD. One chapter covers all aspects of Digital Photography and includes a section on understanding histograms. It also includes our complete digital workflow along with tons of great Photoshop tips. Other chapters include "Equipment; What's New?," "Advanced Composition and Image Design," "It Ain't Just Birds," and "Advanced Sharpness Techniques & Creating Pleasing Blurs." The "Practicalities" chapter will include a detailed section on setting up your backyard for bird photography as well as sections on photographing on safari and on the tundra. In addition it covers the every day aspects of handling and transporting your equipment from setting up your tripod to packing and traveling by air with your gear. Nearly all of the images in the book include all the technical data as well as our legendary educational captions. Most chapters include one or more galleries designed to illustrate and reinforce the principles covered in the text. There are two copies of the book on the CD. The "Spreads" version is best if you would like to enjoy the beauty of the images and the layout and design. The "Single Pages" version was designed for easy reading. The "Exposure and Flash Simplified" chapter re-visits two subjects that give folks the most trouble. Since the publication of ABP in 1998 we have refined and simplified our teaching in these two areas and these new approaches are covered in this all-new material. “Is the sun in or out? What is the overall tonality of the scene? When the sun is out at full strength your evaluative or matrix meter is smart. When it is cloudy, the same meter is dumb and needs your help. In addition to teaching this new approach to exposure the section on flash covers the use of fill flash, the use of flash as main light, and—for advanced students—the use of Manual Flash as main light. Other than the information in this chapter, virtually all of the material in ABP II is new. ABP II, a professionally burned and manufactured CD version replete with a cardboard CD case and CD face art, was released in November, 2006. You can purchase a copy now for $40 plus $2 shipping and handling: http://www.birdsasart.com/ABPII.htm. Folks who purchased a pre-publication version of ABP II may purchase the final version for only $10 plus $2 shipping. After beginning work on ABP II, I realized that the CD book would not be ready for quite some time but that the information on digital photography, Breezebrowser and Downloader Pro, and Photoshop was of great value to the legion of folks just getting started in digital photography, thus we began offering our Digital Basics file (DB) that includes free updates for as long as I am around pushing the shutter button. You can learn more about DB ($20 for the PDF that is delivered by e-mail here: http://www.birdsasart.com/digitalbasics.htm. The Digital Chapter in ABP II contains virtually the same information as in the April 2005 version of Digital Basics. The additional information (including the complete workflow for making conversions in Adobe Camera RAW) in the May 2006 update does not appear in ABP II. For this reason, we advise that serious digital photographers purchase both ABP II for the amazing wealth of information that it contains and DB so that they can receive the free DB updates that contain the latest and greatest Photoshop techniques that I have learned. The December 2006 update included all of the wonderful Photoshop tips that I learned from Alejandro Furman on the last Katmai bear boat trip including making and using color selections, darkening selected portions of an image, and removing color casts, and the next update will include info and comments on CS3. Canon EF 600mm f/4L lens with the EOS-1D Mark III. ISO 400. Evaluative metering +2/3 stop: 1/1250 sec. at f/5.6 in Manual mode. 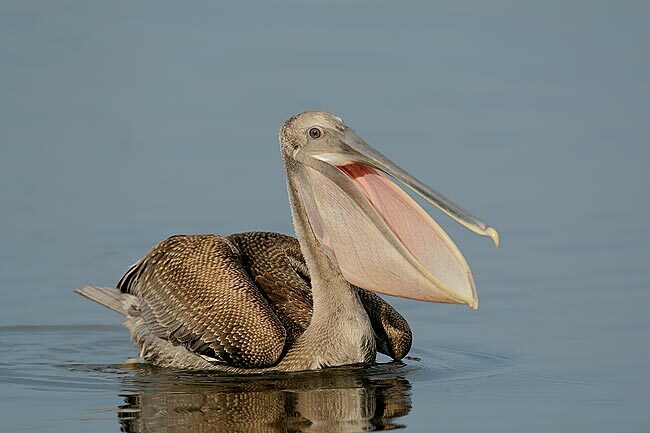 The variety of subjects available right now on Froggie’s boat trips is simply astounding; the young pelicans in fresh plumage are both gorgeous and tame. We e-mailed the MIII User’s Guide Update on Tuesday. If you have previously purchased the MIII UG and have not received your update yet, please e-mail us (and let us know how you paid) so that we can send you the update and add your name the distribution list. Here is some additional info on C.Fn. III-2. It would seem that setting C.Fn. III-2 either to Slow or to the setting between Slow and the default may prove to be best for most flight and action photography, but that if you are photographing birds or animals coming right at you at fairly high speeds then setting C.Fn. III-2 to High might be best. The above is a sample of the detailed info that is included in the 12,825 word MIII UG. You can order your copy of the Mark III User’s Guide PDF (sent only via e-mail) right now for $20. As is usual, Paypal is quite convenient. Alternatively, you can call us at 863-692-0906 with credit card in hand or send a check for the correct amount made out to “Arthur Morris” to us as follows: Arthur Morris/BIRDS AS ART, PO Box 7245, 4041 Granada Drive, Indian Lake Estates, FL 33855. Last note: it is my understanding that there will be a new firmware release for the MIII this week. Details to follow. Gary has been working very hard to try and satisfy all of the BAA subscribers who are on the MIII waiting list in a timely fashion. With huge demand and relatively small shipments, he is doing his best to keep everyone happy by getting them cameras as quickly as possible. If you would like to get on the list, you can contact Gary as follows: by phone at 1-800-221-1830 ext 2332 or by e-mail me at digitalguygary@wbhunt.com. Canon EF 70-200mm f/4L IS lens (handheld at 200mm) with the EOS-1D Mark III. ISO 800. Evaluative metering + 1 2/3 stops: 1/1000 sec. at f/4 in Manual mode. As we have been trying to drum into your heads for years, when the light levels are very low (as here—in early, early morning), the meter is dumb even when the sun is “out.” In order to avoid serious underexposure in these situations you need to add lots of light. When I attempted to download the images, the card crashed Downloader Pro. Windows was able to look at the contents of the card without crashing. Then my rescue attempts went from bad to worse as trying to open a file would crash my PC. I installed a new HDD rescue program that I recently downloaded here: http://www.z-a-recovery.com/register.htm. It worked perfectly and I was able to rescue all of the files as TIFFs. Then I batch renamed all the file extensions using another program. The rescue was a success and after the extraction and renaming both Photoshop and Breezebrowser were able to read and open the CR2 files without any problems. 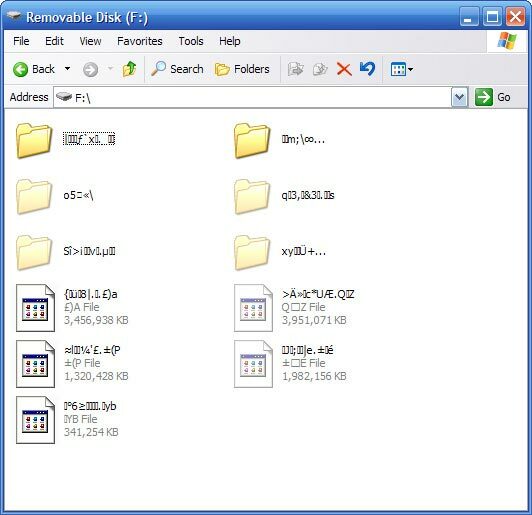 The HDD rescue program was also able to extract some files from the previous day even though the card had been formatted in-camera that morning. This is something important to note for anyone that has ever formatted a flash card with new images that haven’t been downloaded. I will create an image rescue tutorial with complete details and step-by-step instructions on exactly how I rescued my files. It will be included in the August APTATS newsletter. (Robert’s July APTATS newsletter was sent recently to the more than 500 folks who signed up after seeing his June newsletter that was attached to the last BAA Bulletin.) If you are not on my APTATS newsletter email list, you can sign up typing APTATS Newsletter in the subject line and e-mailing me at Robert@RobertOToolePhotography.com. Of all the images that I was able to extract and save, this is my very favorite. June 4-10, 2008 (Limit 6/5 openings; this trip needs 4 to run.) Coastal Brown Bears, bears with cubs, bears clamming, bears courting, bears with foxes, foxes. Bald Eagle chicks in the nest (nearly guaranteed), Glaucous-winged Gull & Black-legged Kittiwake colonies, sea otters. Whales and endangered Steller’s Sea Lions possible. Scenics. Macro instruction; learn how Robert uses a spherical diffuser to create his incredible macro images. You can learn more about Robert here: www.robertotoole.com. Robert has been on the Bear Boat with Chuck. He is a Photoshop wiz and a superb Photoshop instructor. He figured out how to use Quick Masks to make your Photoshop sessions far more effective, efficient, and rewarding. He is the author of APTATS PDF. Robert is talented and extremely creative. I learn from him often. His vertical image of a Bald Eagle in flight was honored in the 2006 BBC Wildlife Photographer of the Year Competition (and I guarantee you that it will not be his last…) He has co-led more BAA IPTs than anyone but me <smile> There will be lots of time for Photoshop lessons and image-sharing around the galley table for those who wish to indulge. (There is electricity on the boat.) I wish I were going! Five full and two half-days of photography (weather permitting). Halibut fishing optional. Fish can be shipped home from Kodiak. Once across the strait, it will be bears and birds. We should see lots of big boars in Hallo Bay and have some good chances to photograph bears clamming at close range. Courtship, copulation, spring cubs, bears feeding on grasses, and Arctic Fox are all likely possibilities. Bald Eagle chicks will be in the same nest nearly every year. (Chuck has several back-up nests.) 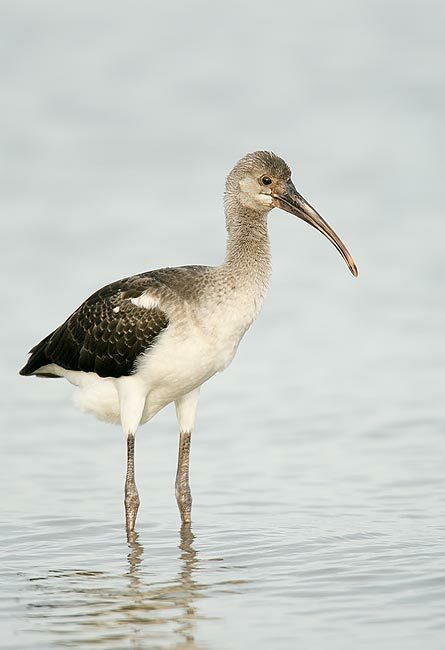 On the same island as the usually-occupied eagle nests there should be nesting Black Oystercatchers and Glaucous-winged Gulls. 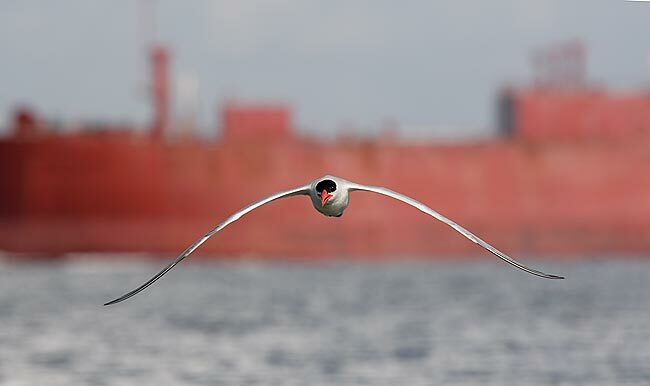 Photograph a Black-legged Kittiwake colony from the boat at fairly close range. There will be lots of opps for flight photography. Registrants MUST be in Anchorage by the afternoon of June 3, but it is highly recommended that you arrive on June 2nd so that you do not risk missing the boat due to a flight delay. 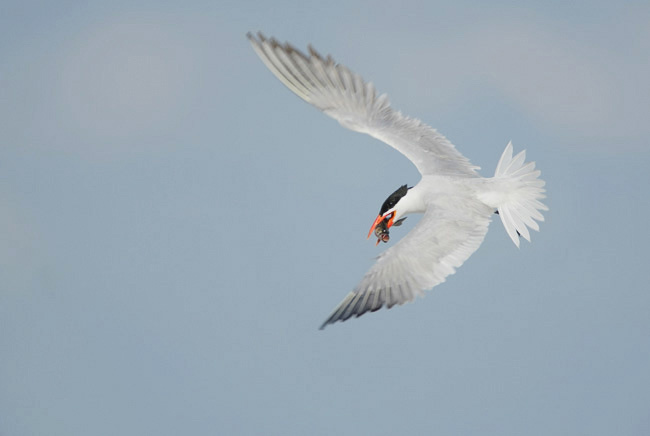 (There will be some good stuff around Anchorage to photograph: nesting Mew Gulls and Red-necked Grebes are likely…) If you do come on the 2nd, that hotel room is on you. Dinner in Anchorage and intro slide program early evening June 3rd. $5999 includes flights to and from Kodiak, return float plane flight to Kodiak from the boat, a shared hotel room on the night of June 3rd (single supplement: $85 if available), van transport on Kodiak, shared (small) stateroom, and all meals on the boat. If Erik is back again, I can guarantee absolutely amazing food… If not, then just great food. Not included: your flight to and from Anchorage and the tip: $200 total per person tip recommended. 1st installment: $2500 due Oct. 4, 2007. Canon EF 600mm f/4L lens with the 1.4X II TC and the EOS-1D Mark III. ISO 400. Evaluative metering at zero: 1/2000 sec. at f/5.6. I used the manually selected sensor to the right of center to create this image. Canon EF 600mm f/4L lens with the 2X II TC and the EOS-1D Mark III. ISO 400. Evaluative metering +2/3 stop: 1/400 sec. at f/10. The soft light on our Thursday afternoon trip was a blessing. Here,45-point AAFPS performed perfectly. Reports that the MIII is unable to hold focus on birds in flight especially with backgrounds other than sky) would appear to have been greatly exaggerated (possibly fanned by the flames of internet hysteria). Canon EF 600mm f/4L lens with the 1.4X II TC and the EOS-1D Mark III. ISO 640. Evaluative metering +1 1/3 stops: 1/800 sec. at f/5.6. 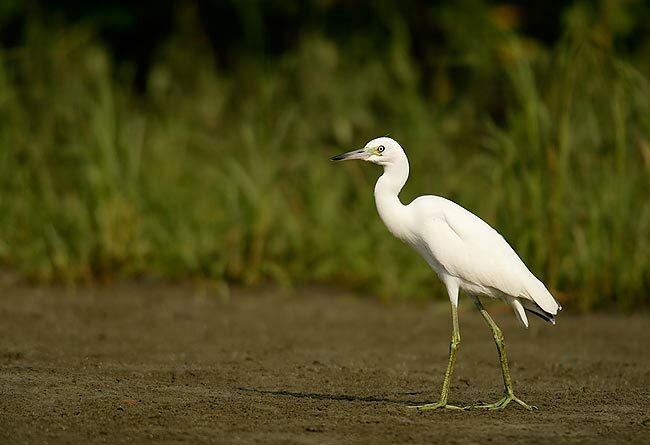 This bird may have been hatched less than 100 yards from where it fed in the shallows. Using the techniques outlined in Digital Basics (http://www.birdsasart.com/digitalbasics.htm) this image was optimized in less than two minutes in Photoshop CS3. 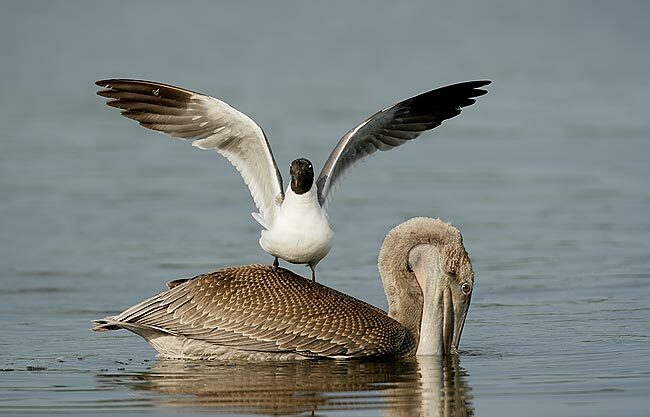 The Laughing Gulls often land on the pelican’s backs or heads in an attempt to scavenge the baitfish that escape from the pelican’s bill pouch as it squishes out the water. In the full resolution TIFF it is easy to see that the gull’s feet are nestled down about 2-3 inches in the bird’s soft feathering. Canon 600mm f/4L IS lens with the 1.4X II TC and the EOS-1D Mark III. ISO 400. Evaluative metering +2/3 stop: 1/800 sec. at f/13 in Manual mode. Even in bright sun it may be necessary to add some light after checking the histogram; remember: you always want at least some data in the fifth box! Canon 600mm f/4L IS lens with the 2X II TC and the EOS-1D Mark III. ISO 250. Evaluative metering +1/3 stop: 1/320 sec. at f/14.